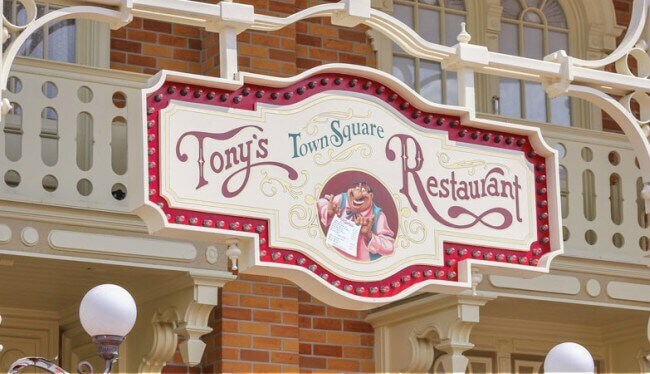 Tony’s Town Square Restaurant serves Italian cuisine on Main Street, U.S.A. at Magic Kingdom. Many dishes are not authentic Italian. Tony’s cooks Americanized Italian: spaghetti and meatballs, pizza, and New York strip steak. When at Tony’s, you are not eating in just any Italian restaurant. Tony’s transports guests back to a specific time and place: the Victorian era Midwest town of Lady and the Tramp. This is where Tony served spaghetti and meatballs in an alley to two dogs. If you look through the restaurant’s rear window, you see Lady and Tramp enjoying a dinner date. 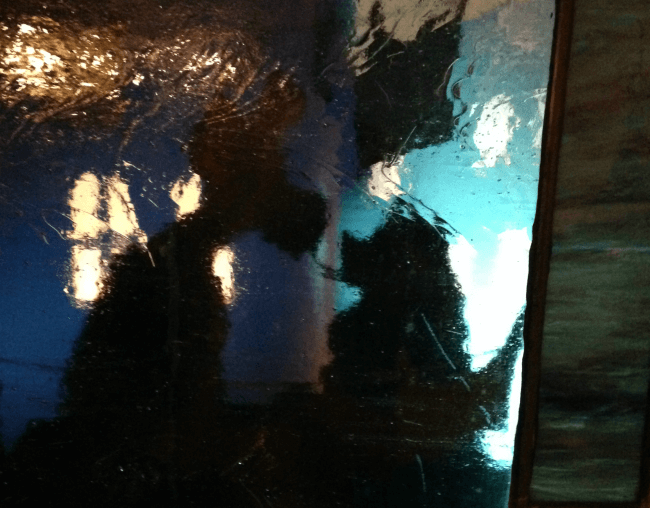 The atmosphere at Tony’s really depends upon the person. In general, Tony’s delivers a family style Italian feel with a Victorian flare. It is certainly not upscale, but is still a nice place. Patrons are seated in one of two areas. The first is the bright and open garden room. Flowers hang from high ceilings flanked by tall windows with white, lacy trim. Wonderful views of Main Street, USA pass by outside the windows. The second area is more dark and cozy. Diners sit at booths on black and white tile floors. Dark wood tables and details give a more intimate feel. 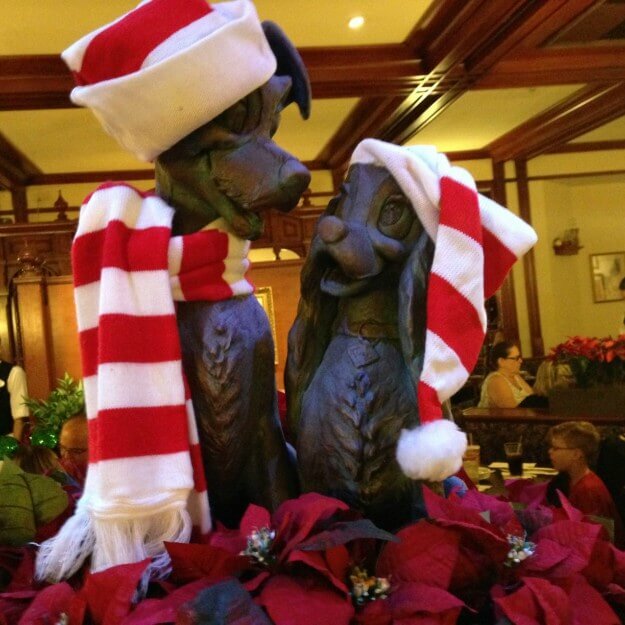 If you are a fan of Disney animated classics, then Tony’s is much more. The Lady and the Tramp fountain is a not so subtle reminder of the restaurant’s story. Music adds to the illusion. Listen for Disney classics like “Bella Note.” Make sure to step to the back of Tony’s and take a quick peak at the famous doggie date. As would be expected at a Disney establishment, service is top notch. A pleasant and attentive wait staff promptly take your orders and keep check on you throughout the meal. The food is served fresh and with relatively little wait. While reservations are recommended, they are often not essential. Tony’s serves tasty, family style, Italian food. This is not fine dining. It is not supposed to be. Your options are far superior to any Disney quick service restaurant, though. Generous portions quench your appetite. While not the best Italian that I have eaten, Tony’s, in my opinion is better than chain Italian restaurants. 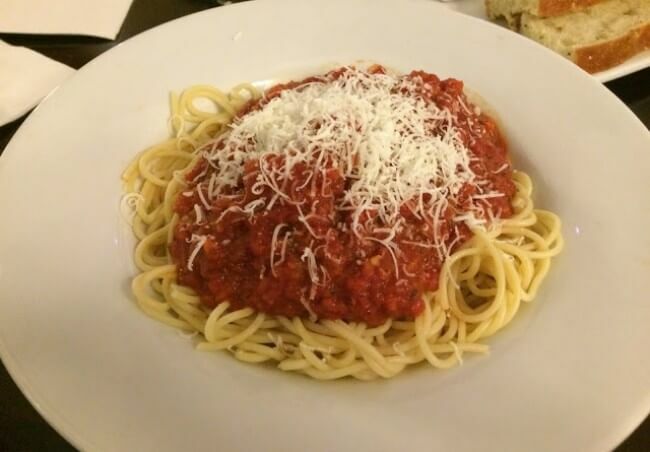 We have tried the spaghetti and meatballs (an obvious choice! ), margherita pizza, and baked rigatoni. We always swap out bites and sample each others dishes. Each of us were delighted with our dishes and also liked the others. Adults will spend from $18 – $26 per entree. While this is steep, it is fairly average for Disney table service restaurants. Tony’s is on the Disney Dining Plan and makes an excellent choice. The serving sizes are large. When the three of us dine at Tony’s, we split two meals between the three of us. We still all leave full and it makes the price not as painful. 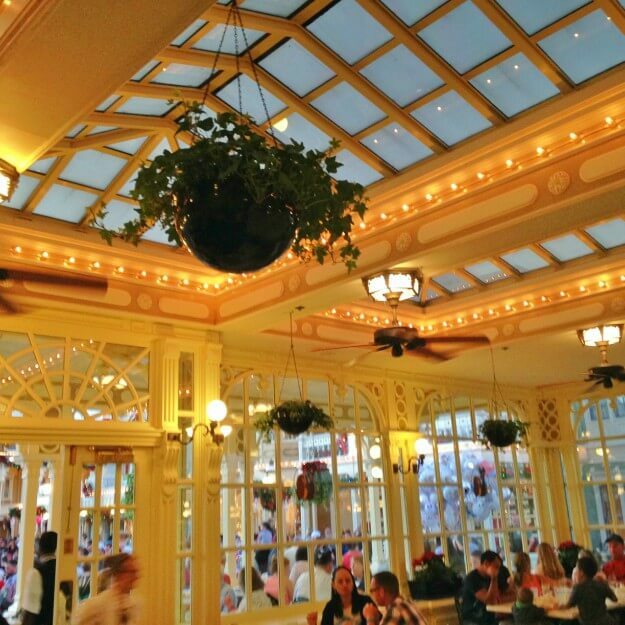 Walt Disney said, “The magic is in details.” The details make Tony’s a wonderful dining experience. Remember, you are at Walt Disney World! Where else can you eat on the edge of a famous movie scene and have a castle at the end of the street? If you want fine dining, then go to Epcot or the Grand Floridian Hotel. If family style fare with a great atmosphere sounds good, then give Tony’s a try. Tony’s is an excellent choice for the Disney Dining Plan. When traveling with children, make sure to watch Lady and the Tramp before going to Tony’s. You and your kids will be drawn in and love it. So fun! I love Lady and the Tramp! I didn’t know this existed. I love Lady and the Tramp, too. It’s a fun setting. Wish I had know about this before our Disney visit earlier this year! The spaghetti dinner was my second favorite scene from Lady and the Tramp (behind “He’s a Tramp”). We are actually moving to Orlando next month and will be looking to explore around town. We’ll keep this gem handy for when we visit Disney. I love the whole movie, but “Bella Notte” is my favorite sone. I hope you like Orlando! The spaghetti scene in the movie is so iconic. I didn’t know that there was a themed restaurant for the movie. Meatballs are one of my favorite things to order at Italian restaurants. Sounds like a great place for families. Most people do not know that Tony’s is Beauty and the Beast themed. Disneyland isn’t great for people who can’t eat gluten, but they do have a couple of options. The atmosphere here is great, so it would be worth checking out. One of the things I love most about Disney is how they tie all the experiences, including dining, back to their films and characters! Didn’t know about this Lady and the Tramp themed restaurant but it does sound good, and serving simple delicious familiar dishes too. Tony’s Town Square certainly lives up to the promise of atmospheric family dining. The decor looks wonderful and food looks appetising. The Lady and the Tramp icons add to it all very well. The Lady and the Tramp theme lends a unique ambience to the restaurant. I find the Victorian era Italian theme fascinating. The spaghetti looks great too. When you are in the happiest place in the world, where you eat is also so important and Tony’s seems to be an appropriate place. I agree. Eating poor quality hamburgers and hotdogs kind’ve ruins the mood. Tony’s and few others, including “Be Our Guest,” keep the mood and imagination alive.